There are an enormous number of beautiful churches in Florence and most are in superb condition. 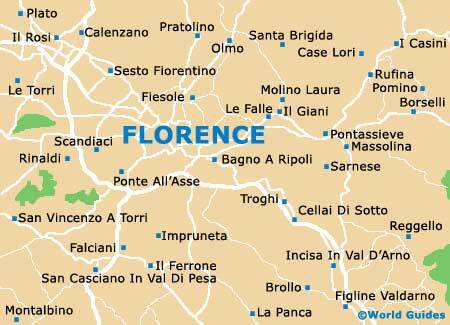 The Duomo, or Cathedral of Florence, is set right in the heart of Florence. Dominating the city with its massive dome, it is actually the fourth largest cathedral in the world. Designed in 1334 by city architect Giotto, the main construction work was completed in 1359, although it took almost two centuries to finally finish everything. 600 years on, it is still the tallest building in Florence and one of the city's most famous landmarks. The enormous dome was designed by Brunelleschi and was a revolutionary achievement, as it was the largest dome of its time to be built without scaffolding, with the inner shell providing a platform for the timbers that supported the outside structure. There are 463 steps to the top of the dome where visitors can enjoy some of the best panoramic views of the city. Other highlights include a cavernous interior, many wonderful frescoes, detailed ceiling mosaics and stained-glass windows created by some of the great artists of the time, such as Vasari, Zuccari, Donatello, Uccello and Ghiberti. Designed and built by Brunelleschi between 1419 and 1469, the San Lorenzo Basilica is widely regarded as one of the city's purest Renaissance churches and was the very first church in this style to be built in the city. The eastern facade has no decoration and the antique brickwork is clearly visible, although inside there is plenty to admire, including bronze pulpits designed by Donatello, who is buried in one of the chapels, a simply stunning staircase built by Michelangelo in the Laurenziana Library and the richly decorated Medici Chapels. Next to the basilica are some very atmospheric palazzos, with interior courtyards and a busy central market. This beautiful, large Franciscan church dates back over 500 years. The building's facade is made up of colourful marble in a geometric pattern and has many interesting features, such as a Gothic interior in the shape of a cross and beautiful frescoes by artists including Giotto, two sculptures by Donatello and an octagonal marble pulpit by Benedetto da Maiano. Famous tombs include those of Michelangelo, Macchiavelli, Galileo and Bardi. There are also 276 tombstones on the floor, many more in the walls, various chapels and some truly splendid works of art to be seen. Construction of this chapel began in 1422 and it is situated inside the Church of Santa Maria del Carmine, built between 1268 to 1474. Highlights include some wonderful frescoes by Masaccio, Masolino and Filippino Lippi. Some of these works have been studied in-depth by other great artists, such as Michelangelo and Raphael. This is probably the most important Gothic church in Tuscany and is the starting point of many tours in Florence. The first church, called Santa Maria delle Vigne, was built in 1094 on the site of an existing chapel. In 1221 the Dominicans were given the church and building work began several years later, creating the present church. The striped facade was completed in 1470 by Leon Battista Alberti. Inside, there are some detailed features, including Masaccio's Trinity, a Giotto crucifix in the sacristy and in the main chapel (Cappella Maggiore) there are also frescoes created by Ghirlandaio. The church is easy to reach, being located near to the Santa Maria Novella railway station. The funerary chapel is covered by a large dome and includes six granite sarcophagi dedicated to the grand dukes buried there, including Cosimo I and Ferdinand II. The main feature of the chapel is the Medici tombs, which were designed by Michelangelo, and the Chapel of the Princes, which was actually commissioned in 1568 and not actually completed until 1929. Construction of this church began over 700 years ago and in 1771 it was severely damaged by fire. It was completely rebuilt by architects G. Ruggieri and G. Mannaioni in 1792, who designed a much grander, baroque image. Situated inside the church of Santa Maria del Carmine is the famous Brancacci Chapel, which is one of the most popular tourist attractions in Florence. Completed in 1882, this elaborate building is huge and represents an important example of a monumental temple. It has been built in the Spanish-Moresque style, with a tall green dome and inside are some simply stunning decorations, including splendid stained-glass windows, incredibly detailed carvings in wood and bronze, marble floors and wonderful mosaics. On the second floor is the Jewish Museum of Florence and in the garden there is also a Jewish school.